When you are choosing a furnace that keep you warm without emptying your wallet. The correct selection of a furnace depends on the size of your home and budget. But in the end, if the furnace keeps you warm with energy saving and lower the utility bill, it means that you have chosen the right furnace and made best investment for your home heating comfort. The average high efficiency gas furnaces have 90% annual fuel utilization, the higher the AFUE rating, the less energy consumes, to keep the home warm and more environment friendly. However, it can be expensive to buy high efficiency furnace but it will pay for itself with the energy you save on utility bills after some time. The variable speed gas furnaces can maintain a constant temperature in your home. 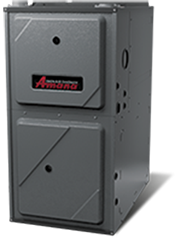 Lennox and Amana are among the most popular HVAC brands that manufacture high efficiency gas furnaces of variable speed. » 4-way installation options: Upflow, downflow, left, right. » ENERGY STAR® qualifying efficiency of up to 96% AFUE offers more heat for less. » Two-stage burner provides a higher degree of comfort. » Variable speed blower provides quiet, efficient circulation. » Compact 33-inch height fits the space in your place. I bought a Carrier brand high efficiency gas furnace about a year ago and I am very satisfied with this model after installing it in my house. I have small kids in the house so I am very much concerned about their health. After choosing this furnace all my fear is gone and I do trust it’s performance even in extremely cold weather. One of the affordable high efficiency furnace from Lennox Merit Series. This furnace has sealed blower compartment and Robust Blower assembly for consistent temperature and home comfort. If you want to control the high energy bills without compromising the home comfort then you can select this furnace for your home. Offers competitive prices for Lennox Merit® Series Model ML195 Gas furnace for the homeowner of GTA. Stop bearing the trauma of noisy old fashion gas furnaces with the installation of this High efficiency furnace today. Lennox is one of the best furnace brands available in Canada. The Dave Lennox Signature series has the most efficiently and quality furnaces range and the model SLP98V with AFUE ratings of 98% and up with dual fuel support and solar ready option can save huge amount of energy and provide consistent air flow with variable energy saving speed motor. Your decision of investing in SLP98V gas furnace will pay for itself within couple of months with significant saving on monthly utility bills and due to its durable design it can be easily maintain with regular maintenance plans for forced air gas furnace at affordable service charges. Elite is one of the finest high efficiency furnace series from Lennox. The EL296E High Efficiency Furnace is from the Elite family from Lennox. The constant torque motor give regular home heating comfort with saving of hundreds of dollar on monthly utility bills. If you need a furnace with quite operation and consistent air flow then you can choose this furnace for your home in Toronto, Mississauga and other GTA areas. In extreme weather condition, it can automatically switch for lower heating output to high output according to the home heating requirement.